Ken Turner graduated from the BAA Animation program in 2007 at the Sheridan College Institute of Technology and Advanced Learning. He has directed short films such as, “Attack of the Giant Vegetable Monsters”, and the stop motion animated short film, “TiM”. He has directed and animated two web series called “The World of Snowboy and Crow” and “SHORT-shorts” as well as published his own story book entitled “Henry: The Heart Boy”. In April 2016, his alternative art poster for “Pee Wee’s Big Holiday” was featured on PeeWee.com by Pee Wee Herman himself. He has worked as a character designer and 2D animator for various studios such as 9 Story Entertainment/Nelvana (My Friend Rabbit, Spliced), Cuppa Coffee Studios (Ugly Americans), Atomic Cartoons , Oasis Animation (Disney Channel’s Lucky Fred), JibJab Media (E-Cards) and DHX Media (Inspector Gadget). His illustrative/film work has been featured on the web for Cartoon Brew, DRAWN!, IMDB, SlashFilm, Rubicon Publishing, Beehive Illustration, Tim Burton Collective as well as in print for The Toronto Star, The Line of Influence: A Tribute to Ronald Searle, Searle in America and Alice’s Wonderland: A Visual Journey through Lewis Carroll’s Mad, Mad World. 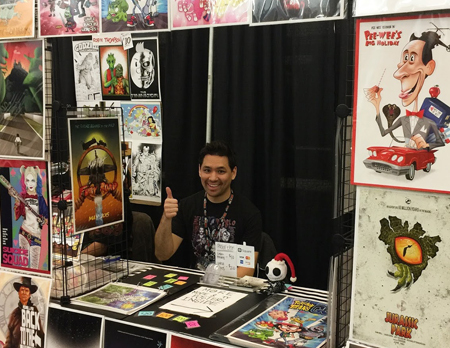 Currently he is working at DHX Halifax as a 2D designer and animator.